Please accept my blessings. I have received your letter dated October 6th and have noted the contents carefully. Formerly I issued one circular letter requesting all GBC members who are zonal secretaries also, to give me a fortnightly report of the activities in his jurisdiction, but I am not receiving. I've received no letter since a very long time from Karandhara, and I'm very interested to know how things are going in L.A. We have a great responsibility to pay $2,000. monthly to the church trustees. In regards to my activities here, I'm trying to open many centers here in India. I've sent the sannyasis letters requesting them to preach from different centers. I'm glad that Subala das Swami has gone to Amsterdam. Similarly the other three may go to other places. Why they are together? Sannyas means they should travel extensively, create new centers and new devotees--that is sannyasa business. Also they can create life members. a) LIFE MEMBER receives all our books thus far published as well as all future publications, as well as a lifetime subscription to BTG. He is also free to visit any of our temples, take prasadam there and stay there if he likes. Price is 1111 rupees (7 1/2 rupees per dollar). b) DONOR MEMBER receives all our literature thus far published as well as a life-time subscription to BTG. Price is 555 rupees. c) SUBSCRIPTION MEMBER receives a lifetime subscription to BTG. Price is 222 rupees. d) COMMON MEMBER receives a one-year subscription to BTG. Price is 33 rupees. So this same system may be introduced in other parts. In regards to how Swami Tirtha's name came up, and so many other things, forget all these past incidences. Let us now work with new life and new vigor. That your confidence in Subala Swami has been restored is nice. Actually they are all nice boys but maya has made them something else. In the course of time, they'll all become nice again. I've seen Ekendra's artwork. See that he is taken care of nicely and he will become Krishna Conscious. I hope this meets you in good health. Please accept my blessings. I am very much sorry that since I have come to Bombay leaving Calcutta I did not receive any letter from you. I hope everything is going nicely there. I do not know also how many life members have been created since my departure for Bombay. I was informed by Tamala from Bombay that the Hamilton House at Dalhousie Square is available for purchase. If it is so, immediately all of you see the house how far it is suitable for our purposes. So far the terms of purchase is concerned, we shall accept any reasonable price provide the place is better suitable than Mr. Jaju's place. Enclosed herewith please find the copy of the letter addressed to Mr. Jaju and immediately see him and do the needful. I am very much anxious to have a center in Calcutta, so both those places are very suitable for our purpose. Now you have to decide which one we shall take and work for it immediately. I am returning to Bombay from Amritsar on the 30th October 1970, and the reply may be sent to the same address c/o Kailash Seksaria. Please accept my blessings. I beg to acknowledge receipt of your letter dated October 6th, 1970, and noted the contents. I am very glad to note your feelings of dependence on the mercy of Krsna and Spiritual Master. Yes, that is the way of surpassing the influence of Maya. It is stated in the Bhagavad-gita that Maya is very strong, unsurmountable, but one who surrenders to Krsna--Maya does not touch him. So, all our books are as good as Krsna because we deal in the books about Krsna only. Therefore, taking shelter of these books means taking shelter of Krsna--there is no doubt about it and if you stick to this principle there will be no attack from Maya. Please conduct the Sankirtana program regularly and that will give me great pleasure. Regarding our new Temple in Brooklyn, Krsna has given you very good chance to serve Him. From the very beginning I was insisting Brahmananda to have a nice place in New York. Now we have got it and Krsna is giving us all other opportunities. Please try to utilize all of these opportunities in His service. It is very encouraging that you have got license from the Board of Education to continue our children's school. Kindly organize it nicely and it shall be a great achievement. We have to concentrate to give them some idea about God--that should be our first business. In art class they should be encouraged to draw pictures of Krsna, Kuruksetra, etc. There are so many subjects for drawing as it is stated in our book Krsna. If they are trained, they will come out nice devotees. It will depend on the process of training. Regarding some misbehavior, that we have to check by training peacefully. Your attitude of tolerance and kindness very nice, so train them in this way. It is Lord Caitanya's order that we have got to discharge welfare activities on behalf of Lord Caitanya. Please offer my blessings to all the boys and girls and children. I hope this will meet you in good health. Please accept my blessings. I beg to acknowledge receipt of your letter dated October 1st, 1970 and have noted the contents carefully. In regards to why you have been branded as Mayavadi sannyasi by society members, that is because you are identifying the Spiritual Master as God. We always represent ourselves as servant of God and you are preaching contrary. The Spiritual Master should be given respect of God but that doesn't mean he is God. That is Mayavadi. You should always remember that the Spiritual Master is the representative of God and should be given the respect of God but that doesn't mean that he is God Himself! You can speak of the Spiritual Master as servant God whereas Krishna is master God. I think this is sufficient to clear the idea. Regarding Swami Tirtha, this is just a rumor because in the past there where such symptoms. Now you should forget about the past, and go forward straight for preaching this Krishna Consciousness Movement. Before preaching of your Spiritual Master as God, you never consulted me whether it was right. This means you were inspired by some external influence. Subala said that it was a mystic influence. Why that was wasn't cleared up until now. That mystic influence was widely spread which I clearly saw in Honolulu, Tokyo or in other words, wherever Brahmananda went. Now we have to forget the past incidences and shall have to go forward with clear consciousness. Regarding punishment, there is no punishment upon you. Rather, there is reward. You have been awarded Sannyas so you have the best opportunity to serve Krishna by preaching His glories. Why punishment? Before taking Sannyas, I told you that you may remain a brahmacari because management in L.A. was with you. Now you have voluntarily taken sannyasa. You may take advantage of this opportunity and preach this Krishna cult and expand missionary activities. Do it sincerely. For my disciples there is no punishment. There is no need for that. 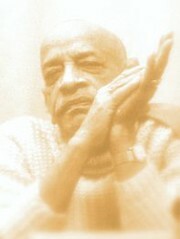 One who preaches Krishna Consciousness is supposed to be glorious. Directly write me and I will give you instructions how you can go on preaching. Please accept my blessings. I beg to acknowledge receipt of your letter from Fiji Islands dated October 4th, 1970, and noted the contents. I am very glad that you are preaching steadily our Krishna Conscious philosophy and this should be done in defiance of all the atheistic propagandas which are so much current. Regarding the impersonalist swamis, don't try to mix with any Swami who has no knowledge of Krsna Consciousness. So their speaking is simply maya, therefore they are called Mayavadis. Lord Caitanya has warned us that anyone who listens to or tries to understand the impersonalist philosophy is doomed, his devotion will become dried up. Regarding worship of demigods, the whole Hindu society is absorbed in this business, so unless our preaching work is very vigorous it is very difficult to stop them. As soon as I return to Bombay I shall send you the tape as you desire. I shall be returning to Bombay by the 31st October. So far the literatures in Hindi, Gugrati and Tamil are concerned, it shall take some time because we have no ready made such literatures. But we are getting Hindi Back to Godhead very soon as Tamala has informed me. Please accept my blessings. I beg to acknowledge receipt of your letter dated October 11th, 1970, and noted the contents with satisfaction. It is most important if you arrange lectures and kirtanas at the schools and colleges because the more intelligent young boys and girls of your country are very much eager to understand this Krishna Consciousness Movement. They are frustrated in so many ways and they are looking for something new kind of happiness which they will find in this Krsna Consciousness Movement. Please also try to introduce our books in the colleges and schools as well as local libraries. I have received word from other centers that our literatures are very well received and often they are being used as course textbooks in the schools and colleges. You are already preaching on the university campuses, so you add this book distribution to your program and make it complete with preaching, chanting of Hare Krsna Mahamantra, distribution of Prasadam and literatures. I know how well this program is received by the students because they are very intelligent. You are also very intelligent boy and devotee of Krsna and Krsna will give you even more intelligence in proportion to your endeavor to serve Him faithfully. Please offer my blessings to your good wife, whose picture in the news clipping is showing nice Krsna Consciousness, and all the other devotees there in our Philadelphia Temple. Please accept my blessings. I beg to acknowledge receipt of your letter dated Tokyo, October 11th, 1970, and noted the contents. I am very glad to know where you are and how you are proceeding on your program for opening new centers in the area of the South Pacific. I do not know if you are going first to Hong Kong as you wrote before or if you are going to Taiwan as you have just now mentioned. There is no question of new or strange places as you have written to say. This Hare Krsna Mantra is understood in any part of the world, therefore the beginning should be chanting in any place and then people will gather and a center will develop by the grace of Lord Krsna. Yes, I have received a letter from Upendra, but I have no information whether his wife has gone there to Fiji. I am very pleased with your sincere service attitude in pushing on our preaching work in these parts of the world and yes, Krsna will give you strength because He is sitting in your heart and the more you try to serve Him, He will give you more intelligence. Please accept my blessings. I'm in due receipt of your separate letters and have noted the contents carefully. The letter addressed to Ksirodakasayi has been approved by me and sent by airmail to London. I think the procedure followed by you for Bombay activities is quite nice. I was thinking of going to Delhi and Vrndavana but, as you say, that my presence in Bombay will be more beneficial. Therefore we have all reserved our seats in the Deluxe Train on 30th October, Friday. We shall start from here at 6:35 a.m. reaching Bombay central station next day 31st October, Saturday by 4:40 pm. I think I shall send you another telegram but you can take it as certain that we are starting on the 30th. On this basis you can make arrangements for meeting the respectful gentlemen and ladies mentioned by you. So far I've not received the copies of the magazines sent by Dai Nippon from Japan. I'm very glad that you are organizing the temple worship at Chembur. It will be a great opportunity to show your capacity how to worship the deity in the temple. Please accept my blessings. I beg to acknowledge receipt of your letter dated October 15, 1970. I am so much pleases that you are carrying on the Street Sankirtana Party as we have instituted in the Western countries even though you have sometimes only one companion. This spirit is most satisfactory and this work is proven as the basis of our successful movement in the United States, so please go on more enthusiastically than ever with my blessings and you may rest assured that Krsna will always help you in any difficulty. Please keep the standard in our Calcutta center and certainly things will be further increased by Krsna's grace. Please accept my blessings. Since a very long time I have not received any word from you. I hope everything is going on well with you in our Los Angeles World Headquarters. Please send me a report of your general activities in Los Angeles Temple and also your Governing Body Commission activities. Please offer my blessings to all the members of our Temples. How is the Deity worship being carried on? Please accept my blessings. I have not heard from either of you since my coming this side to Bombay, so I am very anxious to know how you are each making life members. I wrote one letter to P. M. Thakura to be delivered by one of our men personally. Whether it has been delivered? Where is the big key for Vrindaban? Devananda Maharaja has taken the smaller key from your box, but he did not find the large key. I have written one letter to Mr. Jaju, and he has just replied briefly. Please see him and whether he is really serious? Please keep me informed how things are going on in Calcutta. Hope this will meet you in good health. Please accept my blessings. I hope you and your good wives as well as Srimat Sarasvati are all well. I have safely arrived in Amritsar and we are being very well cared for at the Vedant Niketan. The people and also the Sannyasis here are very much liking our Sankirtana Movement, so things are going on nicely. I am very anxious to know your situation; whether you have removed to the Rama Temple or where you are stationed now? What was the result of my application to the Buildings Society Cooperative? Please let me know. Unless there is good reception for us arranged at Delhi and Vrndavana, we shall come back directly to Bombay as scheduled. There was one manual typewriter left at Seksaria's house which was used for typing up the letters for inviting the press to the conference--please see that this machine is with you or ask Mr. Seksaria for it. Gurudasa has left the Movie projector with you at Mr. Lalan's house and also there were several silver bowls and one set of clothes for the Deities as well as their jewelry which was not packed up by Malati when I left Lalan's with Gurudasa. Please be sure that all these things are with you.